Auto Laundry News: Chemical Dispenser - The Pressure to Choose: Which is Right for Your Car Wash? The first car washes featured an assembly-line tunnel and numerous workers armed with sponges, soap, and water. Today, there are 16,000 conveyor car wash establishments across the United States, which bring in over $9 billion in revenue each year1. Car washes have evolved to provide cleaner and faster results, but the tunnel-style car wash has remained a popular and convenient choice for consumers, and a great investment for owners. According to the 2017 Professional Carwashing Industry Report2, 70 percent of car wash owners and operators expected to increase their businesses’ revenue throughout that year. The same study found that tunnel sales more than doubled for car wash owners over the last several years. With competition at an all-time high, tunnel car wash managers must improve operations and choose the right equipment, such as chemical dispensers and injectors, to run and maintain a successful business. Customers expect quicker service with high-quality results and excellent customer service. 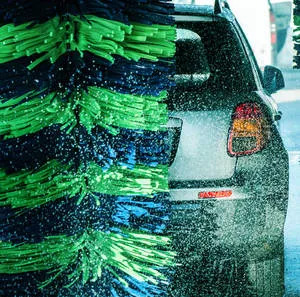 To grow and maintain a healthy customer base, it’s essential for car washes to provide impeccable service, which can range from offering comfortable seating areas, interior car cleaning services, or state-of-the-art technology. Most importantly: car washes must provide the customer with a sparkling clean and dry vehicle ready to hit the road. Apart from labor, chemical is the highest variable cost for car washes. Some car washes spend up to $5,000 per month on chemicals. The chemical cost per wash ranges from as low as $0.30 per wash to upwards of $1.25 per wash. If car wash operators do not have tight control over dilution ratios, they risk wasting chemical and poor-quality results. This makes it extremely important to have reliable chemical equipment that provides accurate dilutions. There is an increasing number of regulations in place to restrict water usage within car washes. To avoid water waste and impact fees, water reclamation systems were developed. In addition to reusing water, it’s important to wash a car right the first time, as a second or third wash will only waste more water. Poorly operating chemical dilution systems could also result in the need to use more water. To make the most of their investment, some land owners choose to build multiple car washes at once. With numerous car wash options for consumers to choose from in one area, it can be difficult for smaller or newer businesses to compete. As newer technology emerges, car wash owners must weigh their options and invest in long-lasting, reliable, and accurate equipment. However, newer technology is not always a cost-effective option for owners. Tunnel car washes generally use several different chemical dilution systems. With a wide range of options, there’s room for error. Some dispensing systems have accuracy issues, failing to meet expectations at very lean dilution ratios. If ratios are off by more or less than 10 percent, car washes could be wasting chemical or over diluting, resulting in poor performance and unhappy customers. In addition to different types of dispensers, car washes use a wide variety of chemicals. From tire cleaner to pre-soak to detergents to undercarriage wash, car wash chemicals range from having very low to very high pH values. With the move to more super-concentrated chemicals, chemical resistance compatibility becomes that much more important. If a dispenser is not equipped to handle newer, highly aggressive chemicals, it will wear down over time and require replacement. Most car washes use either high-pressure or low-pressure systems. High-pressure systems, which use Venturi injector systems (200 pounds per square inch), have become an increasingly popular choice for tunnel car washes. Delivering consistent and accurate mixed solutions, high-pressure systems generally use less water. However, high-pressure systems come at an expensive cost and use larger amounts of electricity. Over the years, low-pressure systems have become an industry standard. Using Venturi educator systems (40 to 60 pounds per square inch), some car wash owners prefer low-pressure systems because they provide longer residence time of the chemical on the car, ultimately removing more dirt and grime. Most low-pressure systems are water powered, almost entirely eliminating the need and expense of electricity. Low-pressure systems also maintain the level of ready-to-use solution and shut off automatically once its tank fills completely. Fluctuations in water pressure can create havoc on car wash dilution systems, making them inaccurate. Look for dispensing systems that regulate water pressure to ensure chemical is diluted correctly every time. It’s also important to seek out systems that allow for easy-to-set flow rates and dilution rates, providing predictable performance and peace of mind. Before choosing a dispenser, research the different types of dispensing systems and find out which brands have proven track records within the industry and won’t require replacement for several years. 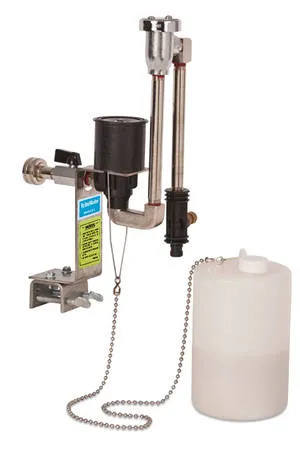 It’s also important to look for a dispenser that is compatible with all of the different chemicals used at your car wash to ensure a long life. The upfront cost of a new dispensing system, along with proportioners and injectors, can be expensive — but it doesn’t have to be. Look into your options and consider using a low-pressure system, since they are a more affordable initial investment and do not require extensive amounts of electricity and reserve water. Today, many car wash owners and operators are new to the industry, so easy repair and maintenance is key. Many car washes operate 12 hours per day to bring in the most profit, so business owners must invest in dispensers that are easy to use and maintain. When repair is needed, easily locating and receiving delivery on those parts is extremely important. Look for a dispenser that is simple in design, making it easy to use for both new and experienced employees. Low-pressure systems are consistently filled with mixed solutions, eliminating any manual pouring or stirring, ultimately reducing inaccurate measurements and downtime. Some car washes attract new customers with their excellent customer service while others install modern cleaning arches with flashy LED displays to bring in new business. However, the key to a successful car wash comes down to the cleanliness of the vehicle. Similar to choosing the proper air dryers and tunnel controllers, it’s essential to install and maintain the right dispensing equipment at your car wash. While technology has evolved, tried and true equipment may be a better fit for your facility over the flashy and more expensive systems. Scott Campbell is a global product manager with Hydro Systems, the world’s largest independent manufacturer of chemical injecting, proportioning, dispensing, and medicating equipment. He can be reached at scampbell@hydrosystemsco.com. For more information, visit www.Hydrosystemsco.com.